When I was a new nurse working in the hospital, I quickly learned who one of my best allies was – the respiratory therapist! As I moved into the ICU, they were invaluable as we weaned patients from the vent and rescued them from death. My second ICU job was at a large metropolitan teaching hospital in NYC. I was working nights in the NeuroSurgical ICU and almost fainted when during my orientation, I was informed that there really was no RT support at night. In fact, the nurses did the vent checks, blood gases, retaping ET tubes (this is where I learned NO pink tape!) and even the weaning and extubation! Say what!! I was grateful for the great RT’s that trained me – I would have been so lost without their valuable insight and knowledge that they instilled in me (and I am pretty sure the patients are thankful also… I still remember my first extubation – not pretty!) Lessons learned and I truly discovered the value of the RT on my team during my shift when I moved on to another hospital. So, you could say, I had a new found respect for the masters of the lungs, wizards of the vents and providers of smoke pipes! But, one thing in my journey as a nurse I have discovered, they find us pretty annoying…. and rightly so! I often come across nurses who lack respect for their discipline and yet want them to rescue their patient they have let go down the tubes. So what do they wish we knew about them? What do respiratory therapists wish nurses would understand? Well, I asked one of them and here is what he said…. You get your assignment for the day and go out to find you patients. Your stress level and anxiety is through the roof. What if the nurse assigned to my patients does not like me? What will my instructor think of me? And what if my patient yells at me?? Or worse, doesn’t like me? Ahhh… the joys of a nursing student! As a clinical instructor, I am always trying to find ways to calm down my students, motivate and engage my students. Here’s a list of my Top 5 tips I always give my students. Hope it helps make the best of your time! Set goals for the day – each week my students have to have three goals. This not only allows the student to self reflect on how they are doing and what they still need to accomplish, but it gives the student and the nurse a starting point. Most days the student is greeted with, “What can you do?” After letting the nurse know, the student can also let the nurse know what the goals for the day the student hopes to accomplish. Some examples of daily goals would be to hang more IV medications. One student told her nurse this goal and the student hung almost all the IV medications for the whole assignment and then some. One of my all time favorite student goals… to see a code. Only a nursing student would wish such ill-will on another human – but, hey, they gotta learn! Get some sleep – often this is easier said than done. The night before clinicals is NOT the time to go out on the town. Be well rested so you can be engaged. Remember, peoples lives (and your future) depends on it. Seek out opportunities – when you find that RARE moment you might be idle, find something to learn. There is so much to see, do, hear, learn – you just have to be willing to find it! Most students are skill hunters – always looking for practicing those elusive skills. But really, the one skill most lack is interviewing and the art of conversation. It is not easy to ask total strangers personal questions, but the only way to get better is to practice. Also, this goes back to setting goals – ask around to the other staff, maybe they can help you meet your goals. They can’t help if they don’t know! Play the “student card” – this has been a controversial tip with some students. I am always preaching to them that they need to own what they know, but then, I tell them to “play it dumb” when the time comes. Essentially, if someone is willing to teach you something – let them! This works especially well with the physicians. When they come in to talk with your patient, introduce yourself as the student – you will be amazed at how much they might want to share – and the patient will benefit too! I had worked at a large teaching hospital for many years and knew who most of the friendlier doctors were. I was surprised one day when one of my students got a whole mini-lecture about cardiac cath interventions from one of the less friendly cardiologist. I made him point out the physician to me in the nurses station because I had never heard this particular physician speak so much! “Student card” well played! Be confident, but don’t be afraid to ask reasonable questions – Even when playing the “student card”, you can still be confident in what you know. In fact, you probably have a better recall of more information than most of the staff because it is still fresh for you. But know your limitations and ask questions when appropriate. Make an effort to seek out information instead of just expecting to be spoon-fed. Your resourcefulness will be refreshing. Plus, most of the world’s information is on your phone! Well, I hope this helps you out a bit as your continue your journey through nursing school – it definitely is an adventure! Do you have some other tips for clinicals – something that works well for you – I would love to hear it! Please leave a comment. Also, don’t be afraid to share/like this post on Facebook, Pinterest or Instragram because sharing is caring! Be safe, study hard and wash your hands! So yesterday was the last group clinical day in the hospital for my senior students. Then today was the last group clinical day for my fundamentals students who will be entering the hospital for the first time in a few weeks. I couldn’t help but reflect on the next chapter they will each encounter…. The seniors are anxiously counting down graduation and stressing that they get their choice preceptorships. I have had the unique opportunity to have these students in fundamentals and then at the end of their journey. It has been so fulfilling and rewarding to see each of them grow and learn. They each will make amazing contributions to the nursing profession and I am so proud of them – just like a mom! My hope for them is that they remember what they know – hold on to it! Do the right thing, no mater “what everyone else is doing”. Treat every patient as the special person that they are – treat them like your family member and you will make the right choice. Go above and beyond – you owe it to them and would want the same. NEVER stop learning -the wonders of healthcare is that it is always changing and there is always something to learn. Make me proud when I see in the halls with my new group of students!! On the other side, the fresh students are anxiously awaiting the unknown of their new roles and responsibilities in the hospital. Documentation, med pass, caring for multiple patients…. it sounds so overwhelming. But, your advice is the same, make the right choices with the knowledge you do have. Seek out every possibility the day brings you – the world is out there to teach you so much – but you have to go find it sometimes. You have the skills and you are ready – now show them what you got!! Good luck to you all – keep in touch…. and make me proud!! 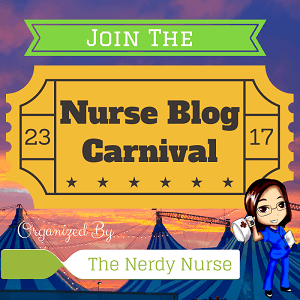 So what advice do you have for nursing students…. leave me your comments and make an impact on the next generation!